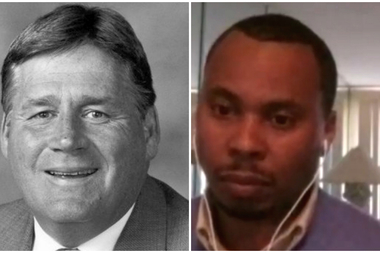 Evergreen Park Mayor James Sexton (l.) says Jackie Robinson West spokesman Glenn Harston's comment on Huffington Post Live calling the village "Anti-African American" is an "attempted diversion of the facts." CHICAGO — A Jackie Robinson West spokesman said the suburban village of Evergreen Park is “perceived as anti-African American” last week during an interview about the league’s attempts to get its revoked U.S. Little League title reinstated. In the online interview with Huffington Post Live host Marc Lamont Hill, newly hired JRW spokesman Glenn Harston II answered a question about whether race played a factor in the league losing its title by saying, “The facts are that Jackie Robinson West that won the U.S. championship was an all-black team. … They shocked the world they won." Their title was stripped, however, after an investigation into whether the JRW players actually lived within the league's boundaries. The probe followed a formal complaint filed by officials with Evergreen Park's Little League team and subsequent coverage by DNAinfo Chicago. “They came from the lonely black district in the nation. All of this unfolded from a … whistleblower that comes from a town that is perceived as being anti-African American, and there’s a lot of racial tension coming from that town," Harston said. Evergreen Park Mayor James Sexton dismissed the comments as an unfair characterization of his village and an “attempted diversion of the facts." “I’m too seasoned to take offense. Consider the source. I’ve been mayor here for 13 years and elected here for 28 years, and I’ve seen this community evolve into a wonderful place for everyone to live,” Sexton said. Sexton said Harston’s statement simply aims to direct attention away from the real issue — that JRW broke Little League rules and got caught. In February, Little League International stripped JRW’s title after it said the league “violated Little League International rules and regulations by placing players on their team who did not qualify to play because they lived outside the team’s boundaries." Further, Little League International determined JRW leaders used a falsified boundary map for its 2014 tournament, and that JRW Little League officials met with other leagues in District 4, which includes JRW and several other South Side leagues, "to try to get the territory they wrongfully claimed was theirs for their 2014 tournament." Little League also suspended coach Darold Butler, ousted District 4 Administrator Michael Kelly and put the league on probation until the league’s treasurer and de facto leader Bill Haley and his mother, president Anne Haley, are replaced on the board. The league remains on probation. “Why don’t they just face up, and if what they did was wrong, it was wrong and not try to find a diversion. And that’s all they’re trying to do is create a diversion with racial issues,” Sexton said. On Thursday, Harston, pointing to a 2013 news report alleging Evergreen Park police make racially motivated traffic stops, said he was just "laying out the facts." "I stand by my statement about the perception of Evergreen Park," Harston said. "You can draw your own assumptions or conclusion. It was a factual statement."